It's been particularly fun tooling around town on the Obama Obicycle in the run-up to Tuesday's election. The excitement here is truly palpable, and, as recent riding companions Joy Rousso and Chester Perry can attest, you can't travel far with the Obicycle without being greeted by the honking of a friendly car horn or a proudly raised arm sporting a big upturned thumb. Chants of "Oh-Bah-Mah" are not uncommon, as well. So what does all this mean for the Peach State? 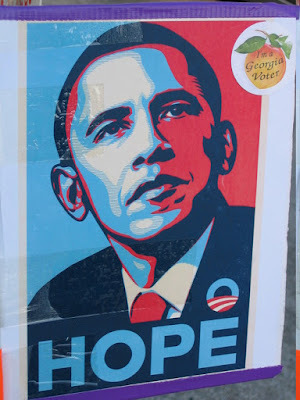 Is Georgia likely to cast its electoral votes for Barack Obama? I've been asked this question a number of times while out on my bike - both in its deceptively-bipartisan, under-the-radar, register-to-vote costume and in unabashed, taking-the gloves-off, fully-partisan campaign regalia. I always answer frankly. "No, it's a long-shot," I say, trying to suppress my heartfelt disdain for the Electoral College system. But I also remind them that a strong turnout for Obama in this state puts Democratic Senate candidate Jim Martin in striking distance of upsetting Republican incumbent Saxby Chambliss, a George W. Bush yes-man, if there ever was one. This is an outcome that no one considered even a remote possibility as recently as two months ago. More importantly - the Electoral College be damned - the votes for Obama will count, if he wins the election, however Georgia commits itself in the official constitutional tally. What I mean by this is that the Georgians who cast their ballots for Obama will feel as if they have genuinely contributed to his election and, as a result, will see themselves - some for the very first time and others for the first time in years - to be part of an revitalized progressive political process in this state and in our nation. This is the hope that an Obama victory brings to traditionally-red states, such as Georgia. This is why I believe that a Georgia vote for an Obama victory will count, no matter what. This is a change that I can believe in, because it's happening right in front of me, right now. A close vote in Georgia would be very significant for a number of reasons, in addition to potentially helping but Jim Martin over the top. Second, it will help build legitimacy for Obama, as he seeks to be president of the entire US and not just 50.1% of the voters. I think this desire to represent the whole country is a vital part of Obama's "new politics." I believe in the Power of the Obama Obicycle!